I’ve had the F-control in my possession for about two months now. I can say first impressions have worn off and I have really settled in to what the F-control really does for my day to day recordings. My first impresses were “neato, oh boy, and now I can build a cart.” But now after two months my thought process has changed to that of “hey… why the f*** didn’t I have this when the F8 first came out? I had to spend too much time diving into menus!” It has become such a important valueable tool that it really is hard to imagine living without it. I look back at projects I did when I first got my F8 and think… I could have done such a better job if I had had the F-Control. You might ask what are the tech specs of this important piece of gear? And I’m not give them to you. 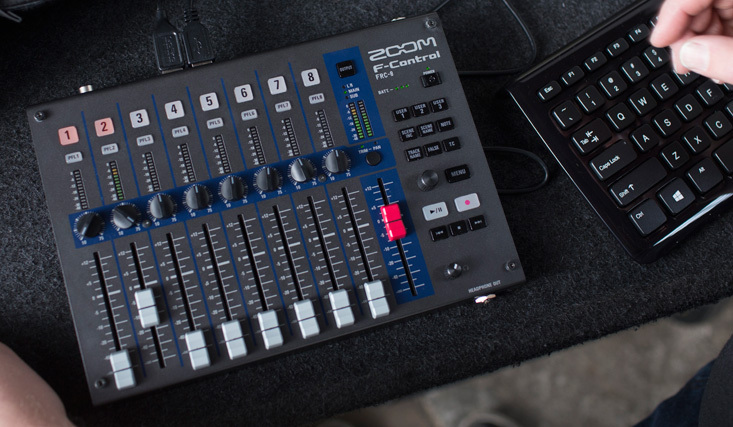 You can go to the Zoom website and read all the cool features for yourself. I’d rather dicussion a few ways in which my set life habits have changed for the better because of the FRC-8. This is the biggest improvement to my day to day set life. No matter how good a shortcut is on a computer or an audio recorder, it still is up to the operator with the fat clumsy fingers to do it right. I can only do the Scene Increment shortcut correct maybe 50% of the time. Often I would mess up, record a half day with the wrong alphas and over lunch in the finder menu relabel tracks. I’m being real, it would happen to me. But now with the FRC-8 it is as simple as a one button push. Now that might sound like sure laziness that I’m excited about going from pushing two buttons down to pushing one but let me put it to you another way. For anyone who played World of Warcraft or any RPG battle game knows the players who use a mouse with macro buttons always perform better. If you watch Twitch, none of the top eSports players battle use a Microsoft keyboard and a two button 1995 mouse. In order for these players to pull of spell combos in combat time and time again it requires being able to hit certain keys in the same order repeatedly. To make it easier and allow them to get into a solid work routine eSport players will create macros and script out key stroke chains to save time and give themselves repeatable results. The FRC-8 is the sound mixer’s version of a high end gaming mouse, giving us the edge to get our jobs done quickly the right way every time. And for me and my fat clumsy fingers, that is it allows me to keep up (and more often then not) ahead of the 2nd AC who may be fumbling with marking the slate. This is more of a vague concept but it boils down to the User Keys and Direct Menu Keys overall just allow you to get up and running quicker every morning. The TC Menu button lets you jam up and skip over a few submenus. The Track Names button lets you do the same. So many of the keys above the transport controls kill the complaint about the F8 being a menu driven audio recorder. There is also a very special button that turbo charges the F8 after Firmware V3.1 and that is the Take Notes key. One of the biggest complaints from Sound Devices users was the metadata notes field on the F8 had to be written in before the take happened or edited in the finder menu after the recording was over. Well now in Firmware V3.1 you can tap the Take Notes key on the FRC-8 and start writing during the take. And the F-control allows for a real keyboard (or 2.4Ghz wireless mini keyboards) to make the notes metadata field even easier to use. This field does not automaticly reset to blank currently after the take is over and that is a bummer but hopefully Zoom can fix this in an upcoming firmware update. It would be nice that when Stop is pressed to end a recording that the notes field resets to empty for the next take. But it doesnt and that’s just something you’ll need to keep in mind if you start to turbo charge your sound reports and take advantage of this metadata field. To any F8 user the idea of creating a decent stereo mix track on the F8 is a chore to say the least. Well that is no longer the case with the FRC-8. When I use the F-Control I personally set the knobs on the F8 to gain and the knobs on my F-Control to pan. This way it feels more like a traditional mixing board. 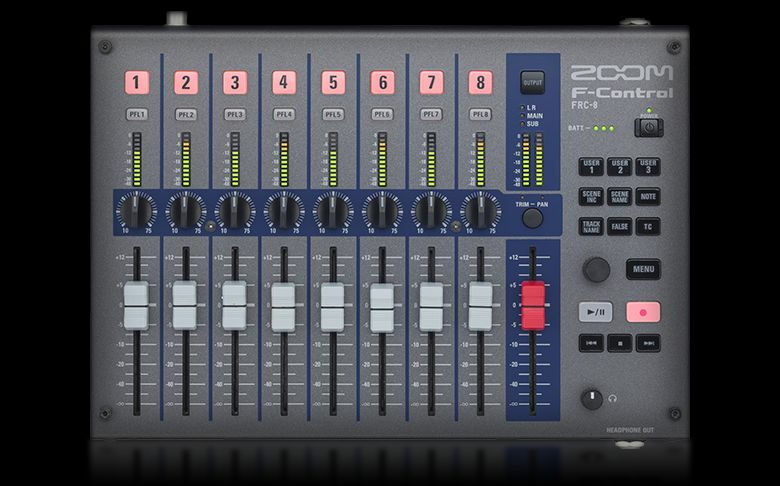 I must admit something, I couldnt tell where the master fader control was in the F8 menu before the FRC8. I never used it. 95% of the projects I did on a bare F8 were mere Polywav 1-8. I wouldn’t even bother enabling the L/R tracks, it just wasn’t going to be a mix I was proud of. 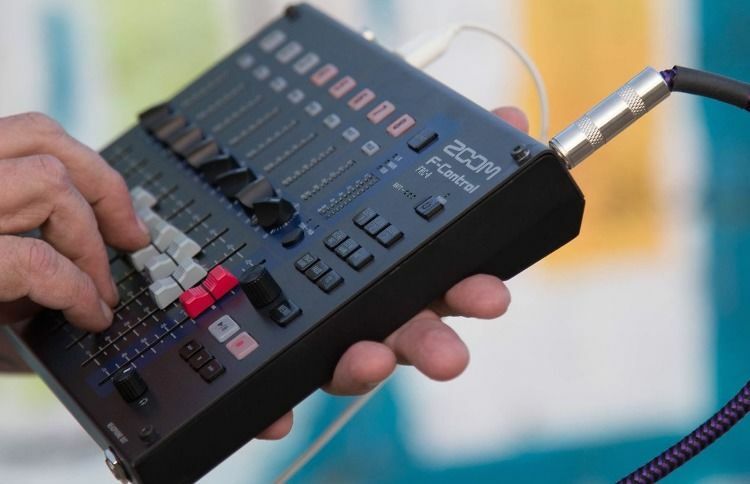 Now given how much mix control the FRC-8 gives, there is a real case to be made that even bag mixers should atleast own one of these and carry it in a laptop case for those moments where a good stereo mix would benefit the production. In conclusion, buy one! Do it. You will love it. And as for that “now you can build a whole cart thing…” given how small the Zoom FRC-8 is… I’ve retooled my cart concept and I’m having fun seeing how compact and small I can make a fully built out cart. Currently I’m using a modified apple box as a eurocart and not missing a beat. Hi Andrew, I’m unable to get my 2.4Ghz mini keyboard to work with my FRC8. Which keyboard have you had success with? You’ve plugged the USB dongle from the Rii into the keyboard port of the FRC8? I bought a generic unbranded Rii ketboard off Aliexprrss and it was merely plug-play. Yeah, no dice. I tried plugging in the dongle before and after powering on/connecting the FRC8. I’m sure there is little consistency in these cheap electronics. Thanks for the reply.